In Oblivion, vampires are people infected with Porphyric Hemophilia, an unusual disease. You can become a vampire—either by choice or by accident—and can subsequently be cured. In addition, vampiric NPCs will be encountered, both friendly and hostile. Unlike previous Elder Scrolls games, you can pass as a living mortal; citizens and the Imperial Guard will not attack you on sight if you are known to be a vampire. Yet, also unlike previous Elder Scrolls games, there are only two quests relating to your vampirism, one in which you become a vampire and another in which you obtain the cure for vampirism. There are also no vampire clans that you can join, nor can you associate with or avoid being attacked by vampire antagonists. However, you can perform The Order of the Virtuous Blood quest while you are a vampire. Regardless of your level of vampirism, you acquire 100% disease resistance and 100% resistance to paralysis. The other advantages and liabilities of vampirism vary depending on how long it has been since the last time you fed on another humanoid. Unlike most skill boosts, these skill increases are implemented as abilities and therefore they increase the base value of your skills. One effect is that you gain skill perks, such as the ability to cast more powerful spells. See the section on skill boost abilities for other advantages. Hunter's Sight (Lesser Power, FormID 0003BEDA) - Night Eye for 30 secs on Self, Detect Life 100 ft for 30 secs on Self. Costs 5 Magicka; can be used repeatedly. Vampire's Seduction (Greater Power, FormID 0003BED9) - Charm 50 pts for 20 secs on Touch, once per day. This skill can be used to bypass the huge disposition penalty that comes with being a high level vampire. Reign of Terror (Greater Power, FormID 0003BEDC) - Silence 20ft for 60 secs, Demoralize up to lvl 6 for 60 secs on Touch, once per day. Embrace of Shadows (Greater Power, FormID 0003BEDB) - Night Eye for 90 secs on Self, Invisibility for 180 secs on Self, once per day. Sun damage is the most obvious disadvantage of being a vampire. At 50% vampirism and higher, you will continually take damage whenever you are outside during the day (6:00 am to 8:00 pm). The amount of damage increases at higher levels of vampirism. To prevent sun damage, you need to return to 25% vampirism by feeding; as long as you do not sleep (or wait/rest) after feeding you will remain at 25% vampirism and be able to travel safely. The level of damage depends upon how bright it is outside; damage reaches its peak of twice the base magnitude at midday. Cloud cover reduces the damage you take from sunlight, but does not eliminate it. Being underwater has a similar effect. 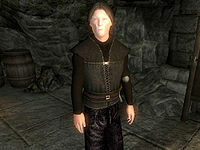 There is no sun in any of Mehrunes Dagon's Planes of Oblivion, therefore vampires do not suffer from any sun damage while in Oblivion. 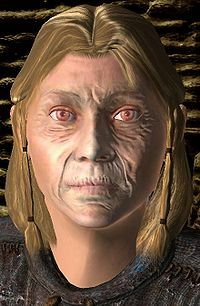 The unique weather that appears in the Planes of Oblivion also manifests outside the Oblivion gates, so proximity to a gate also results in no sun damage, although it takes a few seconds for the weather to change. However, you should take caution in Oblivion planes as many enemies will use fire attacks and there are numerous fire obstacles. Whenever you are taking sun damage, you are unable to Fast Travel. Fast Travel is only possible if it is initiated during the night time, when no sun damage is being taken. You will not receive damage from travel that is done during the day when using fast travel. However, if you arrive somewhere during the day, you will begin taking damage. You can fast travel during the day from any of the houses that you own, except the one in Anvil. You cannot wait outside during the day. At night you can use the wait function, but you must stop waiting before sunrise if you are outside. If your character continues waiting while exposed to sunlight, your character will take damage and will eventually die. Your appearance will change significantly, and will remain so until you are cured. Your character will age by about twenty years, acquiring a wrinkled and pale complexion. If your character has an unusual skin color, this may be changed radically. Others will notice and comment on your appearance if you allow yourself to go beyond 25% vampirism. Your eyes will become a pale red color. You may also lose your eyebrows and facial hair. When you are a full vampire, people may refuse to speak to you, citing your obvious vampirism. This can be countered by raising the NPC's disposition to at least 100, for example using Vampire's Seduction. Guards may refuse to accept yields at the fourth stage of vampirism, forcing you to run away or fight them to the death. There are three ways to become a vampire in Oblivion, which are detailed below. You can only become a vampire once: if you become a full vampire and are then cured, you cannot become a vampire again. Vicente Valtieri during "Darkness Eternal"
Complete all the contracts given to you by senior Dark Brotherhood member Vicente Valtieri, and he will offer you the gift of vampirism (available through Darkness Eternal). In the Mehrunes' Razor download, eating the Beating Heart taken from Msirae Faythung will infect you with Cannibal's Prion and Porphyric Hemophilia. Be sure to let the vampirism take hold first before you use Cure Disease to get rid of the Cannibal's Prion. You can also use the Beating Heart to make a Potion of Porphyric Hemophilia, if your Alchemy skill is 100. Contract Porphyric Hemophilia from a vampire during combat. Each time you are struck with a vampire's melee attack, you run the risk of contracting the disease. Locations where vampires may be encountered are listed at Vampire Dungeons. If you are subsequently unable or unwilling to cure the disease, you will eventually become a vampire, as detailed below. Resist Disease effects - even if at 100% or higher - will not decrease the chance of your character catching Porphyric Hemophilia. This is not a bug; rather, it is a feature - one introduced in the 1.1.511 patch, possibly so that Vicente Valtieri would be able to give you vampirism in Darkness Eternal. Once initially contracted, Porphyric Hemophilia will not take effect until three days have passed, at which point sleeping will trigger the full change into a vampire. After your first rest/night of sleep (72 or more hours after contracting the disease) you will have strange dreams/visions. You will obtain some vampire skills. At least a day after your first rest, a second rest/night of sleep will cause more strange dreams/visions, and you obtain some more vampire skills. At least a day after your second rest, a third rest/night of sleep will cause even more strange dreams/visions, you obtain all vampire skills, and you become a full vampire and highly vulnerable to daylight. Note that at least for the first night of sleep, if you are also due to level up, sleeping will only trigger vampire skills. A second nap will be necessary to increase your level and increase your attributes. For the first 72 hours after being infected with Porphyric Hemophilia, the condition is subject to the rules which govern any other disease, and can be cured in the same fashion. If you become infected and do not wish to become a vampire, you must drink a potion, eat an ingredient (e.g. Mandrake Root or Shepherd's Pie), or cast a spell which cures disease. Alternatively, you could go to the nearest temple and receive a blessing at the chapel altar. If you do not cure the disease within three days, however, you can no longer be cured. At that point, the only way to prevent becoming a vampire is to avoid sleeping for as long as possible. In order to feed, a sleeping humanoid must be found. Feeding on an awake, stunned, paralyzed or dead person is not possible. To feed, simply "activate" the person. Doing so while not sneaking will give a choice between feeding and talking; doing so while sneaking gives a choice between feeding and pickpocketing. If someone else witnesses a feeding, it will be reported as a crime with a bounty of 40 gold (it is treated as an assault). Being caught by someone else while feeding also wakes up the victim. Feeding does not kill or harm the person, and they are not turned into vampires. One thing to keep in mind is that NPCs will not be awoken by your presence if you are not trespassing. Public areas such as guild halls are a great place to feed because you can simply walk in without fear of being chased away. Being stealthy while feeding will rarely result in the humanoid waking up, with the exception of Imperial Guards. Guards seem to often be woken up to the feeding and attempt to arrest you as a result. Guards can be avoided as they offer no special feeding bonuses; feeding on any humanoid will garner the same results. Do note, however, that feeding on other vampires is impossible. Attempting to feed on another vampire will not get a feeding dialog box, but instead the vampire will simply react as though feeding was never attempted. They will wake up for conversation if you are not sneaking, or you will enter the pickpocketing screen if you are sneaking. Preying upon one of the beggars that go to sleep around the towns at night. They often sleep in hidden places and guards don't usually go near them. Also, you don't need to break into anywhere. Feeding on fellow guild members, especially in the Mages Guild which exists in every city. The Fighters Guild works less well, because the porters follow you around. Dark Brotherhood members do not care if you feed on other members. While Cloud Ruler Temple is an option, this is not recommended as the Blades all sleep in the same area. Inns are another source of sleeping people. Churches - although seemingly unlikely - are great places to feed. Every city has them, and the church members routinely go to sleep at the same time in every church. If you own Rosethorn Hall and have the Servants Quarters, you can feed on Eyja. If you have the Vile Lair official download installed, feed on the sleeping prisoner in Deepscorn Hollow. The Gray Cowl of Nocturnal can be worn when feeding; the assault is then attributed to the Gray Fox rather than to you if you are caught. Arkved at his tower is always asleep, no matter what. He is part of the bandit faction, so it will not be considered a crime. While you are a vampire, you are always at least at 25% vampirism. To see this, you can open your Journal, select the Spells/Abilities section and then select the far right Active Effects tab. There should be an effect labeled Vampirism and its number should be at a minimum of 25. You advance through the stages of vampirism during sleep or waiting. After 24 hours without feeding, you will advance another 25% in vampirism the next time that you sleep/wait. You need to sleep or wait to trigger the advancement - the fundamental passing of time is not enough. Note however, that you do not have to pass time in order to trigger the advancement. In other words, if ≥24 hours have passed since your last feeding, you can just start the wait and cancel it immediately. The effect of spending long periods of time without feeding, waiting or sleeping has its downsides. Even if you feed, the next time you sleep or wait you will still advance in vampirism (as if your advancements in vampirism were queued-up). This game of catch-up does not seem to last very long, however. In theory, if you were to stay awake a month or just a week and not feed, the catch-up time would be the same either way. In any case, you can simply counter this problem by repeatedly feeding on the same person several times consecutively until you're clear again. As you progress through the stages of vampirism, you become more and more light-sensitive. You will notice that light glares more and more, especially when there is a great deal of light around you. At night or in the dark, this can actually help you to see things better if you have a video card with the supported shaders. However during the day this can make it difficult to see the details of anything except when underwater. Note: After reaching 100% vampirism (not drinking blood for 72+ hours and then sleeping), you will still revert back to 25% vampire if you drink blood. You will lose the abilities granted by full vampirism but retain the abilities of one being 25%. You will lose a considerable Strength bonus, so exercise caution if you are close to your maximum encumbrance limit. This cycle can be repeated as often as necessary. In the base game, curing vampirism involves a lengthy quest. Once cured, it is not normally possible to become a vampire again (except via console commands), even though Melisande says that her services will be available if needed in the future. You still can contract "Porphyric Hemophilia" normally after that, but it behaves just like any normal disease then - drain fatigue 5 until cured, without any special effects from sleeping. The Vile Lair official download has a Font of Renewal that can cure vampirism much more easily than going through the Vampire Cure quest. Just like with the standard vampire cure, you cannot become a vampire again after using the Font to cure your vampirism. Although it is still possible to contract Porphyric Hemophilia after being cured, a character can never become a vampire again without the use of a mod or the console. This is due to the fact that either method of being cured of the condition sets pcvampire and vampire.hasdisease to -1. Since you cannot have porphyric hemophilia twice at the same time, this value can never reach 1. Prior to being infected they are both set at 0 and this is what allows the transformation to take place. There are several mods that change this, and different ways of doing it via the Console. Console commands can be very useful when dealing with vampirism. The console can be used to infect you with vampirism, cure the disease, or simply fix your facial features. Below are some of the most useful console commands; More detail is provided in the Console Command Tutorial section Vampirism and the Console. This will make you immune to reinfection through normal means though, so if you plan on getting reinfected it's advisable to use a different method from Console Command Tutorial Section. If the potion does not remove your abilities see the appropriate Console Command Tutorial Section. To infect yourself and become a vampire more immediately, enter the following commands into the console: Set PCVampire to 1 and Set vampire.hasdisease to 1. After you sleep or rest you will be at 25% vampirism the same as if you had been infected normally and waited 72 hours. Female players can fix their gender by using the Console to enter the command sexchange twice. If this does not work as is the case with the bug where using the command sexchange will cause the head to disappear altogether instead of reverting to female, enter the command showracemenu into the console. Adjust your characters appearance to female and then save the game before hitting "done". Load the game you just saved, and your female pc will look female again. After entering the above, feeding will reset your powers to 25% vampirism. If this doesn't help cure and then regain vampirism as suggested in Console Command Tutorial Section, Method 2 for both. First nightmare: You dream of someone sleeping peacefully in his bed, when a shadowy, gaunt figure silently enters the room. Approaching the bed, the figure leans down and sinks its fangs into the sleeping person. After a few moments, the pale figure rises, blood dripping down his/her chin. As color flows back into the vampire's face, and his/her features fill out, you recognize the face as your own. You awake screaming. You dream of long days spent basking in the sunlight of your native lands. You feel the warmth and the heat, and feel your body become refreshed. Then you awaken, knowing it was but a dream. In your dream, you see a beautiful young woman holding an infant to her breast. It is only as you draw near that you realize that the woman is a desiccated corpse and the child is purple and bloated, dying of plague. As mother and child crumble to dust, you awaken. In your dream, an old wise-woman treats you for burns on your hands. As she applies a salve to your skin, you feel the tingle of magic as the pain begins to subside. But as you watch, the flesh of your hands begins to bubble, crack, and split, falling in chunks to the floor of her hut. As the wise-woman smiles, you wake up. In a dream from your childhood you remember playing hiding games with your young friends on a warm summer afternoon. You hide in your parents' barn, sure you will not be found. Soon, the sweet smell of hay is replaced by a darker, sickly smell. You move deeper into the barn, only to stumble on the rotting corpses of your parents, their throats ripped out. You try to scream as your parents rise and pull you into an embrace. You dream of a sumptuous banquet spread out before you. You feast on a particularly choice cut of roasted meat, and its aroma makes your mouth water. It is only as you cut into the last portion that you see the larvae squirming inside. You cough blood as the larvae begin eating their way out of your stomach. You lay on your back, with a blissful feeling of peace swirling through your brain. Your every muscle is relaxed. There is no tension in any part of your body. You feel completely at ease. As your vision comes into focus, you notice others standing around you. As a man leans towards you, you recognize the robes of the Necromancer, and you see a glint of light from his scalpel as it begins to cut through your flesh. A warm, gentle breeze causes a tickle on your face, but as you go to brush it off, you find you cannot move your arms. Looking at your skin, you realize that it has turned to a brittle, green glass. Standing perfectly still, you breathe in shallow gulps of air, knowing that moving would cause your skin to shatter into thousands of pieces. The tickle on your face worsens, and you know that you are about to sneeze. As your skin shatters, you wake up sweating. In your dream, you open your eyes to a beautiful blue sky. The sun is bright, but you feel cool, even a bit damp. You draw a breath but begin to cough, as you expel blood and dirt that you've inhaled into your lungs. As you try to draw another, you see a shovel of dirt being emptied onto your face. The sunlight grows fainter as you view it through the soil that covers your body. You would scream, but your mouth fills with dirt before you can make a sound. In your dream, you approach a vampire ancient. Having just completed a perilous task for him, you swell with pride, sure that he will now bestow even greater power upon you. The entire clan's eyes are upon you. Walking towards the dais where he stands, you realize that your task for him is actually unfinished, and that all of your vampiric powers have left you. You cry out as the clan descends upon you, and the ancient's fangs rip into the flesh of your throat. You dream of walking through the cool night air. Your body cries for blood, having not fed for days. Weakly, you stumble to a small pool. As you bend down to it, you see that it is not water in the pool, but warm, fresh blood, steam rising off of it. You lower your head to drink, but cannot open your mouth. As you realize in horror that your lips have been sewn shut, a pair of cold, white hands reach out from the pool and draw you under. It is important to remember that until you actually wait or rest, the changes won't be triggered. If you do not want the powers and bonuses of being a full vampire, then it's much better to use spells or potions to heal yourself, and fast travel around the map to consume time instead of waiting/resting. Although this will in theory allow you to prevent changes indefinitely, you will eventually need to rest in order to level up. In that case, the easiest thing to do is to go to an area frequented by beggars such as the Imperial Waterfront District. Wait in one hour successions until all your changes are complete, then feed on the sleeping beggars. This might be somewhat tedious in the length, though, especially fast traveling to pass time. The attribute bonuses from vampirism behave similarly to attribute bonuses from birthsigns. For example, if you have 80 base Strength and full vampirism, your total Strength will be 100, and you will not be able to increase your Strength if you level up. However, if you feed before leveling, you will only have a +5 attribute bonus, allowing you to increase your base Strength. At 100% vampirism you can max out your Strength, Willpower and speed at 115. If you raise these attributes before becoming a vampire, then you can bring these to 120 at full vampirism. If you are planning to become a vampire, one good race to choose is Dunmer, because the 75% Resist Fire will offset the vampire's weakness. Conversely, the Altmer is a race to avoid because of its extra 25% Weakness to Fire. If you are concerned about your character's appearance, feed frequently so that you do not go past the first stage of vampirism. Your character's face will stay relatively normal, e.g., you will look nearly the same as you did before the vampirism. This can also be achieved by loading another save prior to loading the vampire save, (similar to the sexchange bug workaround, above) which results in the character's face being similar to their pre-vampire appearance, without any wrinkles or aging, but retaining the red eyes. After being cured, your face will lose the monkey-like features of the final stages of vampirism, but it will be wrinkled and withered, similar to signs of aging. Eating Garlic actually does not harm you if you are a vampire. The only vampire affected by the substance is Vicente Valtieri. If he is carrying any garlic (he doesn't have to eat it), he is afflicted with Damage Strength 100pts, Damage Endurance 100pts, Weakness to Normal Weapons 100%, and Weakness to Magic 100%. At 50% vampirism and above your character will actually begin to smoke when taking sun damage, though hardly noticeable. If you look close enough on a dark background you can see wisps of white smoke coming off your waist and shoulders. Your skin may also darken and return to pale while taking sun damage. Hostile vampire NPCs (such as those found in abandoned forts, mines, caves, and Ayleid Ruins) will still attack vampire players. 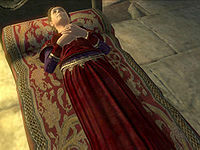 Some of the vampire dreams are very similar to those experienced in Morrowind. The Vampirism effect itself only changes the character's appearance - the other effects are implemented via extra magic effects and scripts. When loading a vampire character save from the main start screen, your character's face may be altered to the default face. Female vampires may have their face changed into that of an elderly male vampire (although the rest of the body remains female). To avoid this bug, load a non-vampire save from the main start screen, and then load your vampire character save from the in-game load menu. Alternatively, load the desired save, use the Console to add the cure (as detailed above), drink, then reload. You may fix this by completing the Vampire Cure quest, then reloading the game that you had just loaded. The character will be a vampire still, but be returned to female. If you save as the male version, the character might not change back. 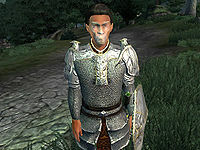 The statue of your character in Bruma—which appears after the Great Gate quest has been completed—will always have the default face if your character is a vampire. To prevent this, use the Console to remove just the appearance of vampirism (player.removespell 3DB3A) before you reenter Cloud Ruler Temple after the battle, and add it again once inside. The counter for the incubation time is not reset after you cure yourself of Porphyric Hemophilia before becoming a vampire. The result is, next time you catch the disease you will have only 72 hours minus previous incubation time to cure yourself before becoming a vampire. Advancing the base level of a skill past a perk breakpoint (25/50/75/100) while that skill is boosted by vampirism may prevent the perk dialog from being shown, e.g. if you have 25% vamprism (+5 Sneak) and your true Sneak skill is 49 (54 displayed) you will not be told about the perk when you next advance your Sneak skill. If you equip both a bow and a shield, after feeding, you will be able to see the shield and bow equipped on your character at once (as opposed to seeing the bow and having the shield invisible, and not giving you an armor bonus). There are known cases where you will receive the armor bonus as well as having your bow equipped. Occasionally, the feeding animation doesn't play and your character simply stands still. This does not influence your feeding. You will still receive the feeding message and you will go back to 25% vampirism. Saving outside while taking sun damage then reloading will cause the game to crash and the save can no longer be used. You might not become a vampire even when you sleep after three days or more. If you are playing on the Playstation 3 Game of the Year Edition, you cannot cure vampirism. See the quest page for more details. Occasionally, your vampirism level may increase the first time you wait, fast travel, or sleep after feeding, regardless of whether 24 hours have passed. See the talk page for more discussion. ?